Contrary to popular belief, Bangkok and Phuket are not the only cities that draw tourists to Thailand. Although the capital city does attract the lion’s share of visitors, destinations such as Ko Samui, Hua Hin and Chiang Mai have become increasingly popular in recent times. The World Travel and Tourism Council projects that Thailand’s tourism industry will see an average annual growth rate of 6.7 percent over the next decade. According to the Thai government and the country’s Tourism Promotion Association, the country's revenue from visitors has already grown by 8 percent this year, in comparison to previous annual growth of 3% to 5% per year. The government is optimistic about the upward trajectory in visitors, aiming to reach 10% growth in tourism income in 2018. To achieve this target, it has rolled out various promotion packages by rallying of various agencies together to ride on the recent figures, promoting the country as a global tourist hotspot. The newly-industrialised Thai economy is one that is heavily reliant on exports, that centre heavily on such areas as Computers, delivery trucks, rice and textiles , making up more than two-thirds of its gross domestic product (GDP). At the end of October 2017, Thailand’s finance sector readjusted projected export growth from 4.7% (estimate as of July 2017) to 8.5% for this year. The positive correlation between exports and economic growth that will increase GDP, strengthened by a generally positive outlook moving forward, will ensure that the country’s financial health remains on an upward trajectory for the next several years. The Thai government has also introduced several tender opportunities for bidders to contribute to the nation’s infrastructure. Projects up for bidding include an inter-city rail network system, enhancements to the highway network to link with the key areas in the country, a public transportation network (Bangkok) development plan as well as air transport and maritime development. These initiatives will strengthen the appeal of the country with such incentives as lower transport costs and easier access to the respective cities – helping to boost the economy further over the next several years. 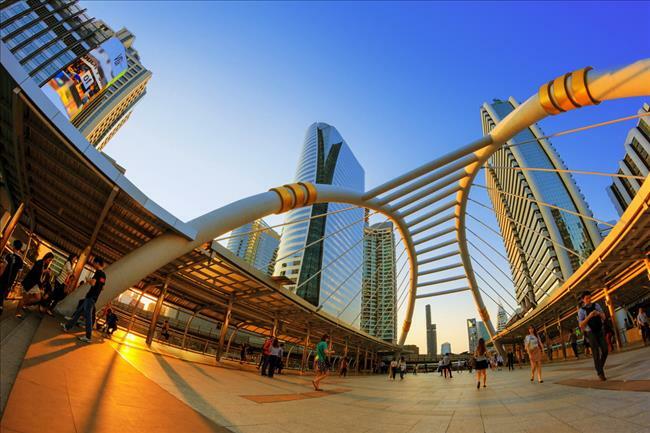 The overall ascent of the Thai economy will have a positive impact on the country’s property market for several reasons. The infrastructure initiatives of the government, for example, will create an influx of foreigners as well as businesses that will move to Thailand, increasing demand for rental properties and thus increasing rental yields. The rise in employment figures, with more locals moving to urban areas to fill the newly created positions, will also increasing rental demands in areas such as Bangkok, Chiang Mai and Phuket. Thailand’s strong tourism figures together with its heavy reliance on exports make for a sound recipe for success. Couple these factors with its favourable geographical location, relatively inexpensive cost of living and tourist-friendly approach and what the country has are all the right elements to continue its overall growth steadily over the next several years.